I think you might like to have some fun with with your Thai friends, so I made this video. I suggest you to try to say these phrases slowly first, get fimiliar with the words, tones, vowels. When you feel comfortable saying each word then add the speed, just try to say it faster! The big giant is chasing the small one. In the morning (I) eat stir-fried winter gourd, in the evening (I) eat stir-fried winter gourd. 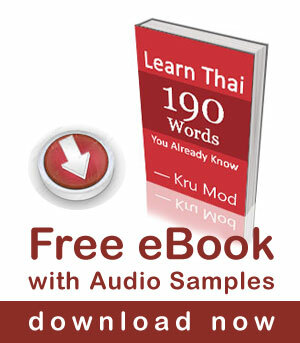 Please let me know in the comment below if you would like to learn more Thai tongue twisters. That was so entertaining, Fun! good job mod… thank you so much….. have a great day..